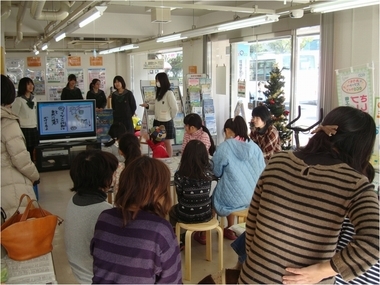 Various reports on environmental protection were presented at a meeting entitled "2012 Session of Earth Keepers (How to build a happier future)" on December 22, 2012, organized by Okayama Prefecture and the Okayama Prefectural Public Interest Incorporated Foundation for Environmental Conservation. We would like to introduce one of these reports to our global readers, about a wonderful project undertaken by students belonging to the Geography and History Club of Sanyo Joshi (girls) Junior and Senior High School. These students are tackling the problem of sea floor waste by cleaning up the sea floor and raising awareness about the problem. We will now report on the activities of the Geography and History club of the Sanyo Joshi Junior and Senior High School. We are tackling the sea floor waste issue, which has become a grave problem in the Seto Inland Sea, by collecting trash on the bottom of the sea and raising awareness on the problem. The Seto Inland Sea where we are working is Japan's largest inland sea and one of its first national parks. This is a photograph of the Seto Inland Sea. It is beautiful on the surface. Where is the waste? If you look at the seabed instead of the surface, you will find that a large amount of waste has accumulated on the bottom. There are three kinds of marine waste: waste stranded on coasts, waste floating on the surface and sea floor waste. The defining characteristics of sea floor marine waste are that: 1) it is normally invisible; 2) it destroys the marine ecosystem by covering the sea bottom; 3) no collector is assigned to deal with it, and 4) it is generated on land and drifts down to the sea floor. These characteristics contribute to the present impasse in which no progress is being made on this issue. While other types of marine waste are collected by public organizations, waste on the sea floor is collected and brought back by fishermen. Nobody pays for this service. 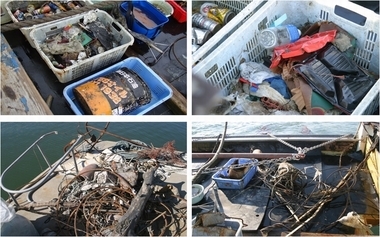 More than 13,000 tons of trash are piled up on the bottom of the Seto Inland Sea. These considerations led us to focus on two activities: actually collecting waste to clean up sea floor and raising awareness on the problem to curb waste generation. 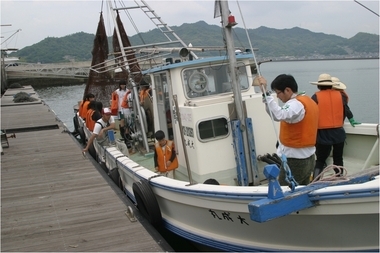 Our collection activities are supported by fishermen from the Yorishima Fishermen's Cooperative, who allow us to join them on their fishing boats to go out and collect trash. For the fishermen, it is more than three hours of additional work on the sea after their early morning fishing run. We are extremely grateful for their cooperation. We collect trash from the seabed using a dragnet. 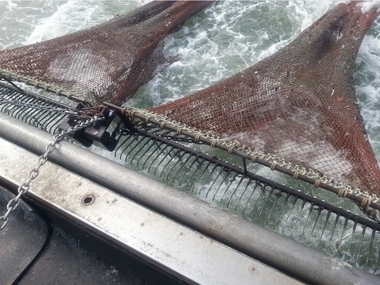 In winter, we use the net with hooks so we can raise a larger amount of trash. These cleanup activities are a struggle against the harshness of nature. 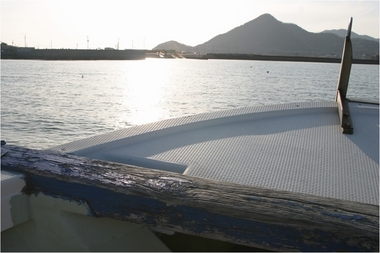 We work on fishing boats without shade under the scorching sun in summer, and in freezing wind in winter. 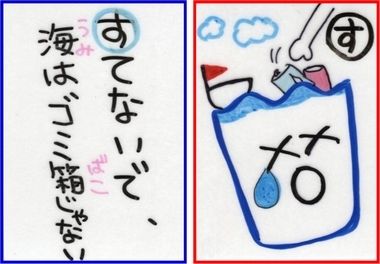 When the sea is rough, we have to fight seasickness. The cleanup work is carried out even on rainy days. These photos show pieces of trash we collected from the seabed. Most of the trash is household waste, including snack packaging bags and PET bottles which we, as junior high and high school students, are very familiar with. It is regrettable that we cannot collect small pieces of degraded trash or heavy waste. Some trash is industrial waste illegally dumped at sea. Marine waste is mostly plastic which does not decompose in the natural environment. We cannot actually see this trash on the seabed, but our fixed-point observations show that the amount of waste collected has been decreasing. By checking the date markings on empty cans, we can roughly estimate how long they had been on the seabed. Some had been lying there for more than 20 years. Of the total marine waste collected, 70 percent came from on-land sources. 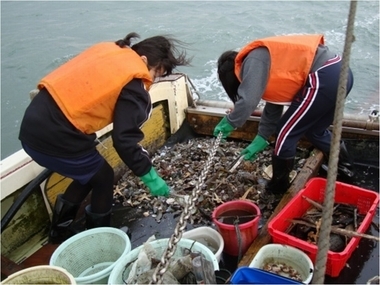 About 700 tons of waste is deposited on the seabed annually. One of the major problems with the seabed waste issue is the low level of public awareness. 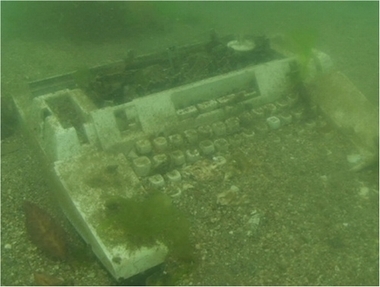 Many people don't know that there is a large amount of trash on the seabed. To cope with this, we are undertaking awareness-raising activities. We believe that these activities will help curb waste generation and lead to a reduction in seabed waste. Our awareness-raising efforts are focused on four areas; media coverage, academic activities, educational materials and community outreach. As for media coverage, our activities have been reported on national television as well as in newspapers, and we received a great response. We also give talks to junior high and high school students across the nation, and present our research results at academic meetings to share this common problem and exchange information. As seabed trash is mostly land-based waste coming from nearby communities, we carry out awareness-raising activities on the street. We also invite children and their parents to join in our trash-collecting activities. Some participants became extremely excited when they touched sea animals with their bare hands. They were also surprised to see how living things were mixed in with the waste. We created teaching materials to promote awareness, including educational videos of our clean-up activities, and marine waste karuta (playing cards) with cute illustrations and short poems, about environmental problems. We gave a presentation about our activities at a local community center. 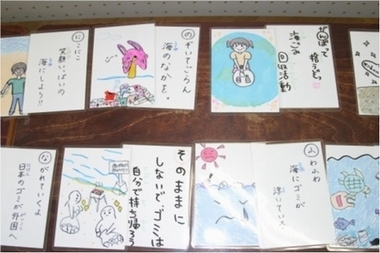 At the end of the gathering, we enjoyed playing the marine waste karuta game with participants and learned a lot from it. News of our activities are spreading around the world. Last year, we went to an international conference in Baltimore, the United States, to talk about seabed trash problems. The world connects through the sea. Trash drifts from overseas to Japan and vice versa. We care about the sea because it is the whole world's heritage. As a result of our campaign, public awareness of seabed waste is growing year by year. We found that the problem is widely acknowledged in our community. A full 100 percent of the people surveyed were aware of our activities. Now we feel confident that we were right. 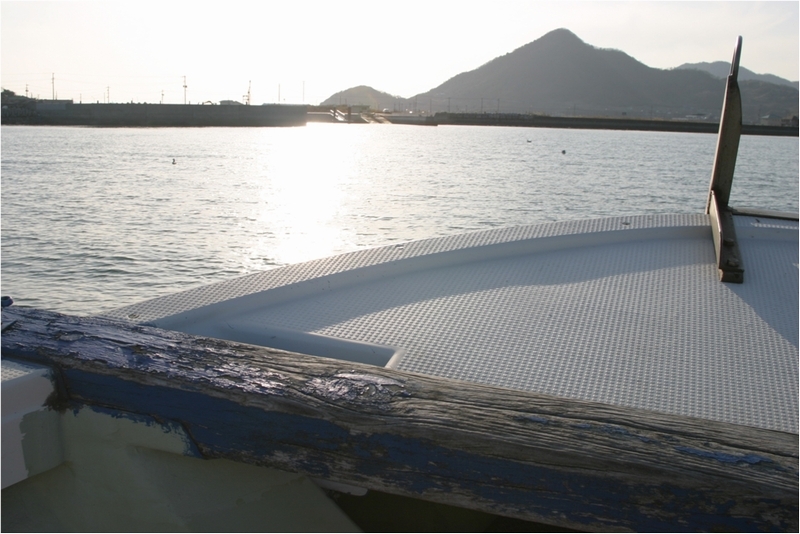 Finally, we would like to introduce some of our marine waste karuta. This one says, "I'm suffocating! The sea is crying." We were informed of a report showing that eelgrass, which nurtures sea creatures, is increasing at the Seto Inland Sea, evidence that the sea is becoming cleaner. "Drifting away - Japanese garbage going overseas." 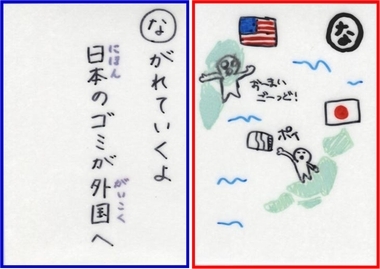 Now, debris from the Great East Japan Earthquake is drifting towards the United States, where Americans will have to pay for collecting the debris. As protectors of the sea environment, we donated money to help support waste collection in the U.S. We understand deeply how hard the work is. 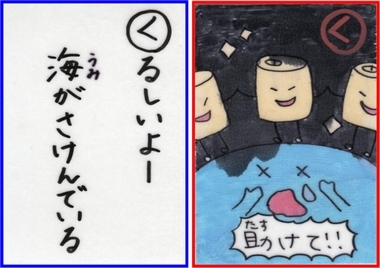 Here's a karuta card that says, "Don't throw things away. The sea is not a trash can." But at present, the sea is a trash can. 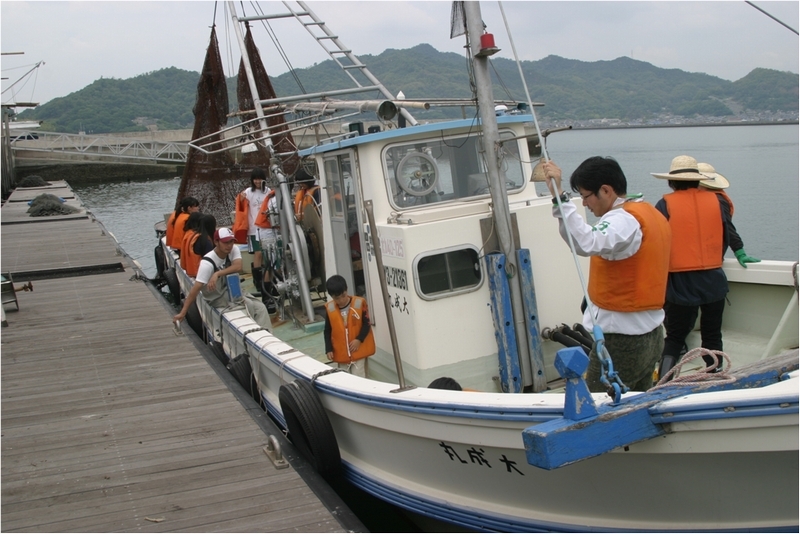 We will continue doing our best to collect marine waste and promote public awareness in order to restore the beautiful Seto Inland Sea. What we want people to know is that the Geography and History club of Sanyo Joshi Junior and Senior High School is not only acting locally but also transmitting their message nationally through the mass media; they are even broadening their vision internationally. We are looking forward to seeing their initiative develop further.